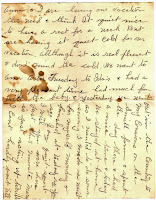 A kind reader sent Dusty D a truly amazing artifact: a scan of an 8-page letter written by a servant working at 118 S. Huron, Henry P. Glover's home. Glover was at various times the mayor of Ypsilanti, the vice president of the Ypsilanti Savings Bank, president of the local Scharf Tag Label and Box Company, a founder of the Dress Stay Company, and a director of the Ann Arbor and Ypsilanti Street Railway Co. Ypsilanti was his oyster, and in his exquisite home this powerful and wealthy man likely enjoyed the finest of clothing, entertainments, and rare and rich foods. In contrast, up in Glover's dormer-room servant's quarters, his domestic servant Bertha Charlotte Wiederhoft looked forward to her widowed mom's dinner of potato pancakes. 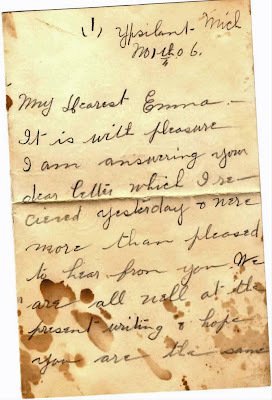 Bertha wrote her friend Emma in Canton, "I cant hardly wait till supper as mother is baking potato pan cakes I can taste them now you probably know how they taste so I won’t have to tell you." Later in the letter, Bertha added, "Say Emma I have just got through with my supper + the Pototas Pan Cakes were fine + ate so much that I can hardly write." Bertha's widowed German mother Eva had lost 2 of her 10 children when they were under 1 year old. Eva's handsome German husband Frederick died in 1903. Bertha's sisters also worked as domestics, including her school-aged younger sister Mary. Anna [Bertha's older sister] and I are having our vacation this week + think It quite nice to have a rest for a week. But are having it quiet cold for our vacation. Although it is real pleasant + don’t mind the cold. We went to Ann Arbor Tuesday to Ida’s + had a very pleasant time had much fun with the baby. + yesterday we went out in the country to my Cousins on the Smith farm + spent the day there + had a nice time + today we stayed at home as I wanted to do some sewing. You wrote about having a mother with five children + we think they must be Bunnies But perhaps the boys may be mistaken. We looked for your Father + Mother last Sunday + thought they would come But Mother thought they wouldn’t come as it was so terrible windy + quiet cold + hope they can come Sunday. Emma two Doctors died here last week Dr. Mc. 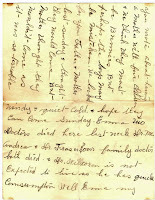 Andrew + Dr. Fraser was our family doctor both died. + Dr. Willcoxon is not expected to live as he has quick Consumption Well Emma my news are getting short so must close looking for a welcome letter from you in the near future. Love + kisses from us all. Though probably one of the poorer people in Ypsilanti in 1906, lacking even a father, working a menial job, and likely from a financially straitened home, Bertha sounds ebullient, loving, and outgoing. She teasingly boasts to Emma about her completed waist, seems concerned about the death of her family doctor, and had fun on her simple outing of a trip to her cousin's farm. 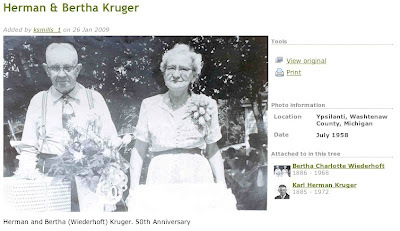 Bertha's good qualities were recognized by Herman Kruger. They married two years after Bertha wrote this letter. Bertha and Herman celebrated their golden anniversary on July 22, 1958 with their son Frederick and daughters Rosena and Carol. Bertha almost made it to her 60th anniversary with Herman. She died in the spring of 1968. 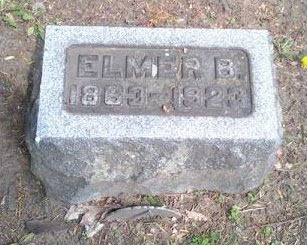 She is buried in Denton Cemetery. Many appreciative thanks to the kind reader who sent this letter! Truly amazing. 1. 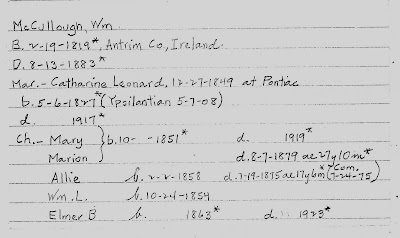 1910 Census, showing Bertha's mom widowed status and her siblings' ages and occupations. 2. 1905 Glen Mills directory of Ypsilanti & Ann Arbor (snippet shown), showing Bertha's and her sisters' occupations. 3. 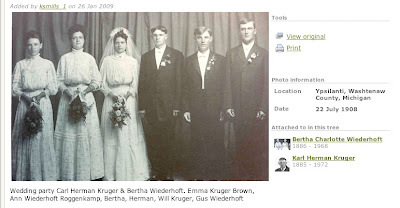 Holding-Wiederhoft family genealogy page. 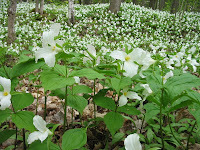 Response to Reader Question: Where did Allie Gather Her Flowers? 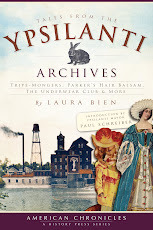 In her latest diary entry, 1874 Ypsilanti teen diarist Allie McCullough wrote: May 30 Sat. Did quite a little work this morning. Carrie N. came down about three in the afternoon and we took the horses and went to Spencer's Woods for flowers. Had a jolly time. Got home about six o'clock and then went to work and made a rockery and put the vines and flowers in it. Kind reader Mr. V. asked, "'We took the horses and went to Spencer's Woods for flowers.' Do we know where Spencer's Woods is?" 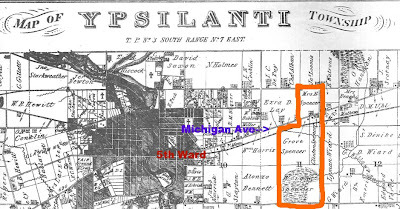 A check of the 1874 plat map (drawn in the same year Allie wrote her diary; click image for larger view) reveals that there were extensive Spencer landholdings just east of Ypsilanti (outlined in orange). There are four landholding Spencers shown. Grove Spencer, Sr. was Ypsilanti's first lawyer, and dead for twenty years by 1874, though his widow Emily lived until 1887. Grove Jr. and Clinton were two of Grove Sr.'s sons. Clinton became Ypsi postmaster in 1871--a one-legged postmaster, whose injury at Gettysburg led to an amputation at the hip. Dunno about the "Wright" shown, without checking down at the Archives. On the 1856 plat map (drawn two years after her husband Grove's death), Mrs. Spencer owns almost all of the land later apparently parcelled out, on the 1874 map, to Grove. Jr., Clinton, and perhaps Wright. Since Grove was deceased, and if his aging widow Emily continued to reside on the parcel on top in the 1874 map, it seems reasonable to suppose that her land might have become overgrown or rewooded in spots. It is a large land plot, and (if none of Grove, Sr.'s children farmed the widow's plot), likely the least farmed parcel of the 4 Spencer parcels in 1874. Grove's widow's plot might have the greatest likelihood of having patches or stretches of woods. Twenty years, the time since Grove's death, is plenty to grow large trees. And it seems from this 1909 recollection that Grove's original farm was widely known as "The Spencer Farm": "One of the Officiating Lawyers, Mr. Grover Spencer, when I first saw the Village of Ypsilanti, was the father of the present citizen, well known in this community by the name of Richard Spencer, the stock buyer. His father's family when I came here lived just East of the little Village on a farm that is still known to many as the Spencer farm." Given the high community profile of this farm, it seems fairly possible that "Spencer Woods" was part of the original Spencer Farm. Grove's widow's parcel would have been accessible to Allie, as it is near her home in the 5th Ward and just down Michigan Ave. It is said that this cemetery was never moved...but that just the headstones were removed, and that it is a burial ground to this day. "When Pat showed me the stone, we both felt that we had to do something about this. I called around in Ypsilanti and the Township. No one even knew of the cemetery or a memorial stone. I ended up talking to the Cemetery Licensing Dept. in Lansing, MI. The information they gave me stated the cemetery was listed as inactive in 1968. I asked about the memorial stone and where were the gravestones. 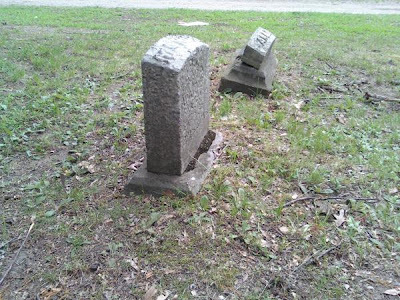 They stated that it appears when the Willow Run School Administration Buildings were built, the gravestones were disposed of and the buildings built over the cemetery! I asked why the graves weren't moved to another cemetery and was told they probably checked and there were no remains left. The bones disintegrated after so many years. So there would have been nothing to move. (Hmmm . . .)"
Given the community's label of Grove's farm as "The Spencer Farm," its nearness to Allie's home, the ease of her reaching it via Michigan Ave, and the possible overgrown parts on the widow's portion, it seems reasonable to suggest that the widow's portion, north of Michigan Ave., and within sight of the modern-day Willow Run High School, was where Allie gathered her flowers. And here is the end of J. H. Wortley's tab for January, 1913--paid in full. The month ends with the usual purchases of bread, more oranges and lemons, and oddly, butter AND oleo (bit of a mystery, there). Surprise, surprise: canned goods existed in 1913, which DD did not know: there's a can of rather pricey peas, and "2 corn (25 cents); 3 peas (50 cents)" a few days later, which also suggest canned goods. 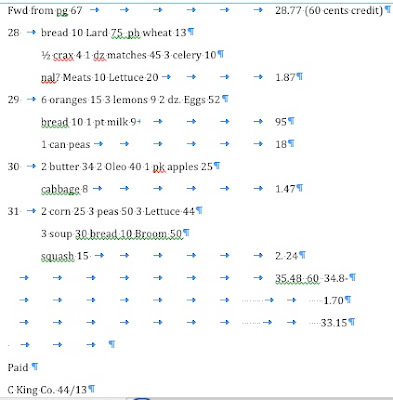 Why in the Sam Hill did this individual/family purchase 24 units of celery in January, 1913?! Another mysterious coconut along with hideously expensive butter and what looks like 3 of the regular 10-cent loaves of bread. Then a dozen (pricey) eggs on Thursday, and that's it till next week! DD notes that the eggs are 3 times the cost of a loaf of bread, which is far from the case today. Why were they so expensive in a city surrounded by a zillion farms?! If any readers can puzzle out "Bu Arkin," or any of the other mystifying notations on this tab, that would be very helpful! The week starts off with some bread, coffee, Jello, and celery on Monday, a quart of "cberries" (cranberries?) and more bread on Wednesday, yet more bread a day later and dog biscuits (this really surprised me!--I had no idea commercial dog biscuits were made this early! ), cabbage on Friday along with some remarkably cheap salmon and 3 mysterious lemons. 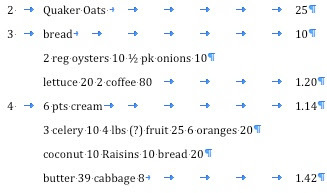 For Saturday, it's more bread, celery, oranges and oysters, and a dozen expensive eggs. 3 lemons 9 1 rice 8 1 lb. ? Cocoa 215 ? Bread 10 The Tack ? 10 Pry Lump ? "Haddie" might be smoked fish, as in the Scottish dish "Finnan Haddie." Wow it's relatively expensive; 37 cents! Sardines are even more fiendishly expensive at 70 cents. And the sardines were bought on a Wednesday...you might think they might be a special weekend treat or for weekend guests, but apparently not. The very next day some codfish is bought--this is a very fishy week. Plus more celery. Oh, and I am guessing "crax" is "crackers." In the grocery checkout line, have you ever quietly spied on the shopping cart in back of you, and formed secret conclusions about the shopper based on his or her choices? "OK, I see what you're doing, there, but--I have to know--what's with the artichoke hearts?!" Or is Dusty D the only one who snoops like this? Hey, I'm interested in my fellow man--and I need to know what he's gonna do with those artichoke hearts. I need to know. 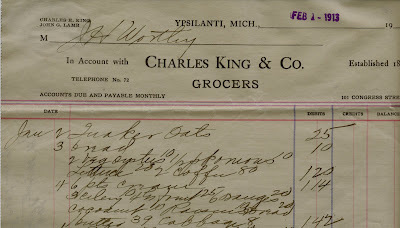 If you're like me, take a look at the 1913 grocery receipt below and see what conclusions you can draw about Ypsilantian J. H. Wortley. 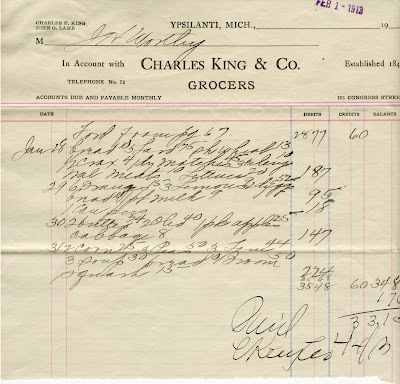 In January of 1913, Wortley ran this month-long tab at longtime Michigan Ave. grocer Charles King's. 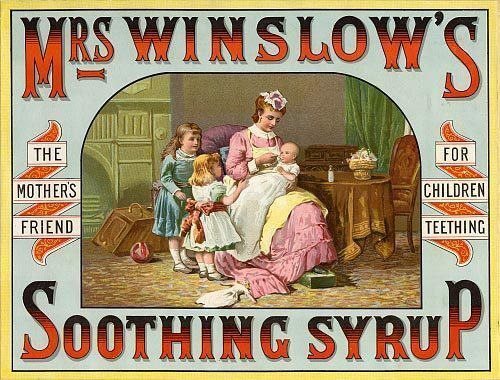 Every shopper ran a tab. 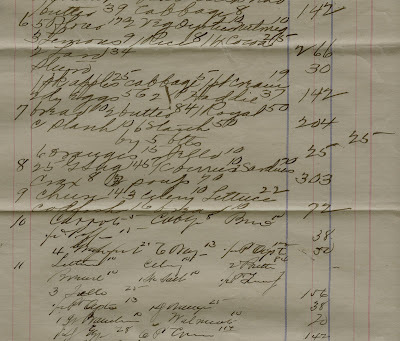 King's kept a big account book, wrote down your purchases when you stopped in, and you paid at month's end. Dusty D. has deliberately not done any research on J. H. Wortley. Was he single? Married? Children? Wealthy or poor? I have no idea. 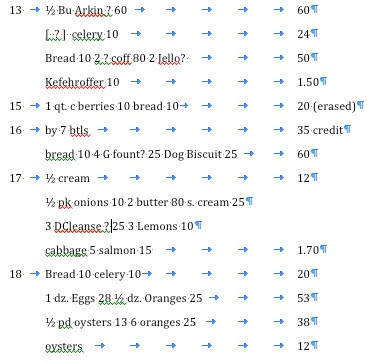 We'll look at each week of purchases in turn and I'll add my transcription below each one. 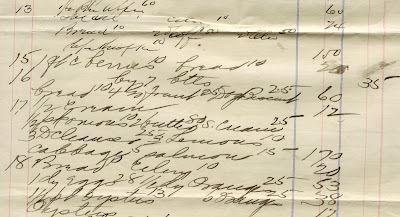 What conclusions can you draw about J. H. Wortley based on his January 1913 grocery tab? And what's with the celery?! New Year's began on Wednesday in 1913. Here's the week of purchases from Wednesday, January 1 to Sunday, January 5. Hey, Quaker Oats! Hm, on the 3rd Wortley's (guess): wife or servant buys lettuce...in January. And three celeries on the 4th--the first of many. Yummy oysters, too. Coconut and raisins? !...rather odd items, that. And seemingly fancy? Since this list is so gigantic, we'll break it up into weekly posts. On to week 2! You may remember that last week Allie was still not feeling quite well. She took the horses with her girlfriend Carrie and went to pick flowers, and made a rock garden. She skipped school and church last week. May 29 Fri. It was so very warm in the afternoon that I could not go back to school. Put on as cool clothing as possible. Laid down, went to sleep about an hour. When I awoke the wind was blowing and it was raining. It stopped in time for Lyceum so I went. Was chairman and had some fun (Pinch Bugs). May 30 Sat. Did quite a little work this morning. Carrie N. came down about three in the afternoon and we took the horses and went to Spencer's Woods for flowers. Had a jolly time. Got home about six o'clock and then went to work and made a rockery and put the vines and flowers in it. May 31 Sun. Didn't go to church but stayed home all day. Had a very good paper to read. June 1 Mon. Very cool today. Stayed up to school all noon. Had ever so much fun. June 2 Tues. There is a show in town. It is show enough to see the people go by for it is upon this ground past our house. Came home from school, found a letter which surprised me very much. Went up to Aunt Lizzie's. Came home and Will insisted upon my going to the show, so I went and stayed to the concert. June 3 Wed. Marion brought home her flowers today. They were very nice. Aunt Lizzie and Clara B. were here all the afternoon and stayed to tea. Carrie N. came down. Had a splendid time. She stayed and went up town to get my hat and lace for my cape. Did not go home until almost nine. June 5 Fri. Intended to go to the Lyceum at the Normal [EMU] and it commenced to rain very hard and did not slack p enough so that we could, so that we could not go. It is perfectly terrible and Will is out in every bit of it. I pity him. Got a letter from Ida tonight. June 6 Sat. Fixed my shirt waists [blouses] this morning and did several other things. Went up to Carrie N.'s and stayed all the afternoon. Went down to Jennie Carson's and her babe is lovely. Went up town all over and then went to Miss Coe's for Mary and then went up town for her. Shortly after posting the recent, perhaps overly jocular, post about the confusion of calling plans in 1913, Dusty D's phone and Internet service abruptly died. It is I believe a felony for a private citizen to misuse this potent device to listen in on someone's phone. So if you see Dusty D biking in your neighborhood with this (heavy!) doodad clipped to my belt loop, it's not because I'm intent on sidling into your back yard...scrooching along the side of the house...pausing to mentally critique your gardening efforts...silently unscrewing the outside call-box...and clipping on my lineman's telephone to quietly listen to your most private conversations. Nosir! ...because like other sensible people you don't have a land line anymore. So I just wear it around town as historical bling. Rockin' it old school, with a 1950s lineman's telephone, oh yeah. At any rate, I gave the lineman my best pot of tender leaf lettuce in gratitude--turns out he is a gardener, and told us a story about a squirrel stealing his prized sunflower. Dusty D is drifting off topic here, so I'll close and get right to posting Allie's diary and some other goodies that piled up in the in-box while Internet was down! *Sheesh, you can't even SEND a telegram anymore; company name update-time perhaps? 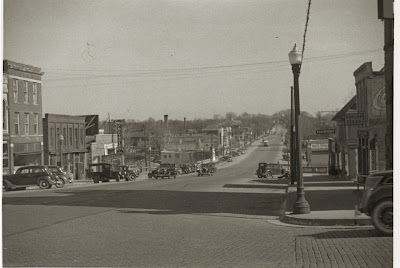 Mystery Photo: Can You Identify This Street? This one is gonna be super easy for some folks and baffling to others. Also, upon zooming in, do you notice any businesses that have (cough) moved across the street? (hint!) Good luck! Response to Reader Question: What Did Materials Unlimited Used to Be? I was wondering if you know the original purpose of the building that currently houses Materials Unlimited? I wandered in there once and asked someone at the counter about it and they said it was an old car dealership. I noticed what looks like a possible old spillway outlet at river level while climbing up the stairs from Riverside Park. Also, there are the remnants of what must have been a cast concrete walkway or platform along the exterior of the building facing the river. If you look at the side of the building at street level you can see where it was snapped off and what would have been the entrance is block by a bolted-on steel fence. I slightly doubt a car dealership would have had a small hydro plant in it. Could it have been an early 20th century manufactory or early city hydro-power plant before becoming a car dealership? The counter person was spot-on; the site used to be a Chevy dealership, as seen in this wonderful old photo (click for larger image). Dating the photo is another matter, here at home without recourse to the Archives' Polk directories which list businesses by year (I'm looking at that Dunlop Tires at right, next to the Ainsworth Mill, which as you can see already has its new and ugly facade). Hmm. 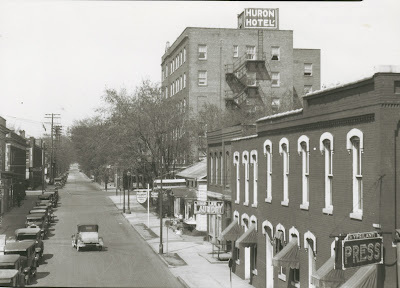 The newest cars appear to be the ones at the extreme left, parked near the present-day Haab's. These cars seem to match the 1935 Ford shown in this old advertisement. The ad was taken from this lovely chronological collection of 1905-1956 Ford ads--just the sort of thing that is invaluable in dating a photo. Dusty Diary is drifting off course here a bit, as always with a photo that offers a million interesting tangents. At any rate, the photo seems to be at least from 1935 and, given that people didn't buy cars left and right during the Depression, possibly quite a few years later, perhaps (guess) up to 1940 or so? So let's say that Materials Unlimited was a Chevy dealership in the mid- to late-Depression era. But what about earlier? The 1856 plat map for the city shows a building on the M.U. site but does not label it. The legend "Worden & Brother" seems to be appended to the big building at the NE corner of Huron and Michigan Ave.
What's that across the river from the M.U. site? A Pelt Factory! Can you imagine what an abattoir that must have been...and how delightful the river must have been downstream? (shiver). 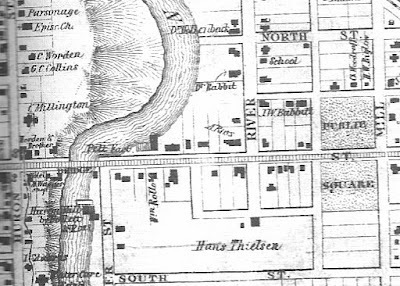 Note that in 1856 Michigan Ave was still a plank road. Nice 'n jouncy. 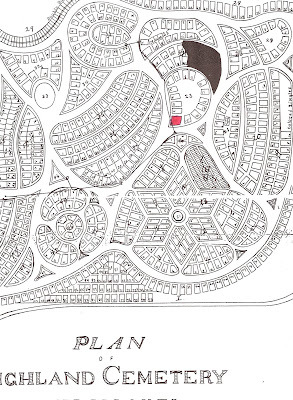 In the 1864 plat map, the little 1856 L-shaped building is gone and there is nothing on the M.U. site. What's that kitty-corner across the street, at the eastern corner of Water Street and Michigan Ave? It's...um, OK, this is getting weird...a foundry owned by William McCullough, Sr. --Allie's dad. Resolutely back to M.U. In the 1874 plat map, there's a "Beach Carriage Man'g Co" on the M.U. site. I have to look east across the river again. Ooh, J. Leetch Brewery has replaced the Pelt Factory. Duds to suds. Guess what. 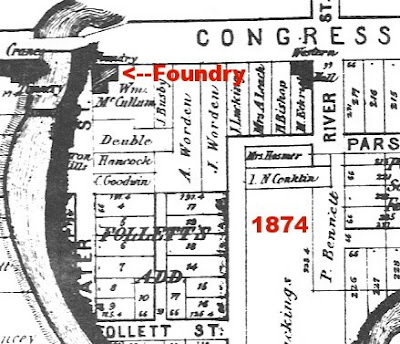 By 1878, William Sr.'s son William L. was running the foundry! Take a look at that rococo grape leaf chair! (click image for larger view). 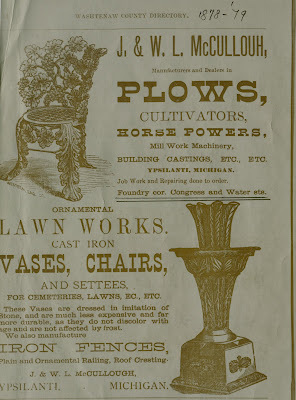 Plus plows, "cast iron vases, chairs, and settees," iron fences...say, any chance the McCulloughs might have had a hand in making the long-lost Starkweather Fountain? Hmm, lemme file that idea away...where was I? The McCulloughs also made iron roof decorations...cultivators...you name it...they were ironmongers. How in the world did they make that ultra-ornate iron grape leaf chair? Is that whole thing *cast*? In one piece? It's absolutely gorgeous. It is a shame Allie never got a chance to sit in it, or have her own grape leaf chair, just for her, in her own back yard. And--one wonders if kind reader K.P. ever found some interesting iron doodad in her old house, formerly Will McCullough's. An ornate plant-stand? A beautiful shelf bracket? Even just a fancy iron doorknob? Maybe...just maybe...that object was made by Allie's big brother, Will McCullough Jr. Wow. Wait--did I answer the original question? Ah well, too late now. Like one o' them new-fangled phones? OK--but you have to choose a calling plan. How about this one? NON-GUARANTEE SERVICE. Calling party deposits nickel five-cent piece [as opposed to the nickel ten-cent piece--ed.] for each local call. 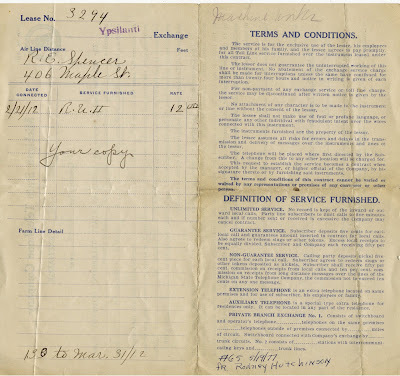 Subscriber agrees to redeem slugs or other tokens deposited as nickels. Subscriber shall receive fifty per cent. commission on receipts from local calls and ten per cent. 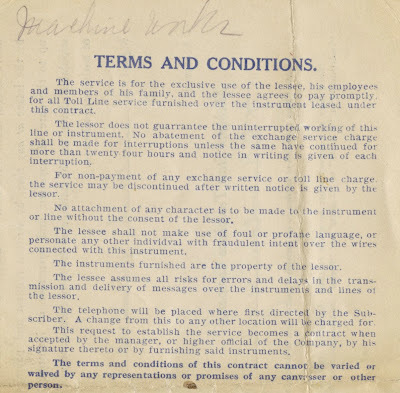 commission on receipts from long distance messages over the lines of the Michigan State Telephone Company, the commission not to exceed ten cents on any one message. OK, well, that plan is out since it's gibberish. How about this one? GUARANTEE SERVICE. Subscriber deposits five cents for each local call and guarantees amount inserted in contract for local calls. Also agrees to redeem slugs [but snails are OK--ed.] or other tokens. Excess local receipts to be equally divided, Subscriber and Company each receiving fifty per cent. Not much clearer. But I love the stern warnings against slugs--clearly this was a big problem as people tried to cheat. But how did it work? Was there a sort of pay phone right in your house? Or just a regular old cardboard box where you put a nickel in every time you called? Bewildering. 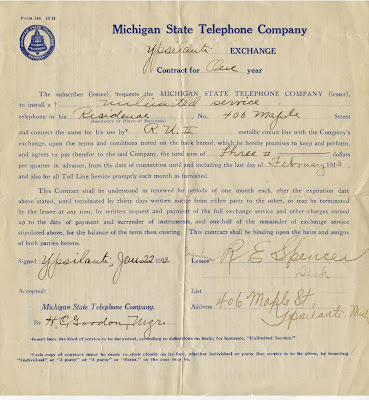 The Michigan State Telephone Company took a dim view of other hanky-panky, too. Such as naughty language, the fifth item in this list of "Terms and Conditions". The lessee shall not make use of foul or profane language, or personate any other individual with fraudulent intent over the wires connected with this instrument. AUXILIARY TELEPHONE is a special type extra telephone for residences only. It can be located in any part of the residence. A special type extra telephone! Ooh! Sounds sparkly! But none of this fazed R. E. Spencer of 406 Maple Street in Ypsilanti in 1913. He signed the contract and was soon chatting away. The contract he signed is duplicated, front and back, below. You can click on either image to enlarge and scrutinize its many weird details. Response to Reader Question: Am I Living in Allie's Relative's House?! 217 Woodard is my house! My deed says it was built in 1916. Is WL a relative of Allie? This information and this question so intrigued DD that I immediately scurried off to the archives to find the answer. Guess what I found. I found the obituary index card for Allie's father, in the obituary card files. Here is the front of the obituary card. You can see it lists William, his wife Catharine, and seven (!) children--including Wm. L., born in 1854! He was Allie's older brother! Allie wrote her diary in 1874, when she was 16--so William was around 20 at the time of her diary. Here is the back of the obituary card. 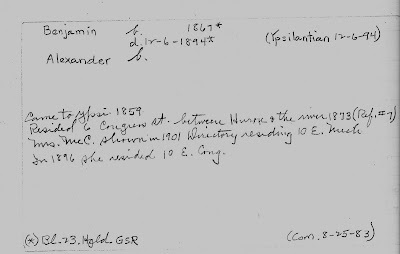 You can see that there is no birth date or death date recorded for Alexander, another younger brother of Allie's. I wonder why; was he stillborn? You can see that his mother Catherine would have been 41 at the time of Alexander's birth--a high-risk age even today. You can see that Allie was the 4th-born child and that she had twin older sisters, Mary and Marion. You can also see that Allie was the exact middle child, in the heart of the family as it were, and that all her younger sibs were male. You can also see that Catharine had 7 children over a span of nearly 20 years! Her little brother's name, "Benjamin" is spelled "Benjamin" on the obit card but "Benjiman" on his gravestone--odd, that. So, to answer the kind reader's question, YES!--you are living in Allie's older brother's house! Thanks to Mr. V. for the invaluable info-tip and to K.P. for the wonderful question! 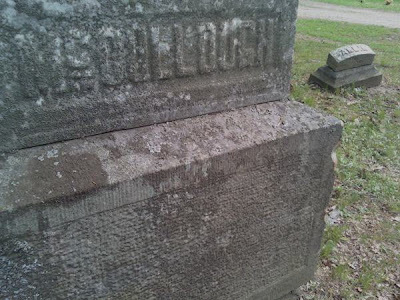 Dusty Diary searched the Highland Cemetery grave index in the Ypsilanti Archives to see if 1874 Ypsilanti teenager Allie McCullough might, by chance, be listed. Dusty D felt a tremor of amazement, and instantly yearned to visit her grave and pay her respects. For new readers: this blog is serializing Allie's 1874 diary, written in the last year of her life. New diary excerpts are posted every Friday. We have come to know Allie as a bright, sociable girl who loved visits from her girlfriends Carrie and Joe and reading papers down at the Lyceum. She was also periodically ill, with a disease that would cause her eventual tragic death. Allie was listed as buried in section 23, in the north half of Highland Cemetery (pictured at top of post). Armed with a map, Dusty D entered the ornate gate, feeling solemn and a little sad. Numbers for the various sections are nailed on cemetery trees, helping to puzzle out navigation. 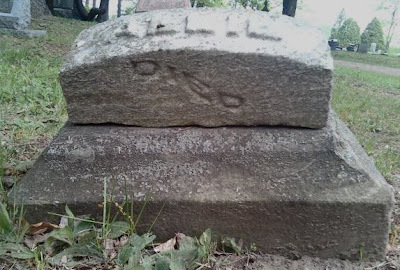 DD rolled her bike past ornate pedestals and humbler, eroded graves. I saw a nailed-up number for a section near section 23. I was on the right track! It must be close...and then, there it was. 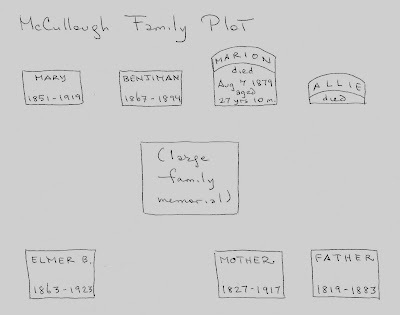 First glimpse of the McCullough family plot. Dusty Diary read the big central memorial with amazement -- there it was, McCullough. But what was the tiny, tilted gravestone in the background? Here it was, the final resting place of the girl whose words Ypsilantians were reading in 2009. I examined the grave. It seemed odd that it was so short, and that it contained only the word "DIED" in a descending script without any of the usual additional information. Had the family been poor and unable to afford a larger stone? Why was Allie's grave so small? Next to her grave was one for Allie's sister Marion. I noted the tall, curved-top style with the legend "MARION" carved in relief on top, just as Allie's grave had her name carved on top. Marion's grave bore an inscription about her death date and her age at death, whereas Allie's had none. This was a puzzle. 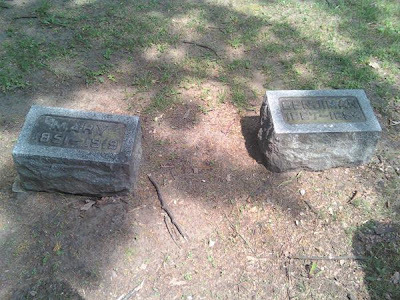 As I gazed upon the two graves and compared them, I saw how rough and tilted Allie's grave was compared to her sister's. A slow suspicion dawned. 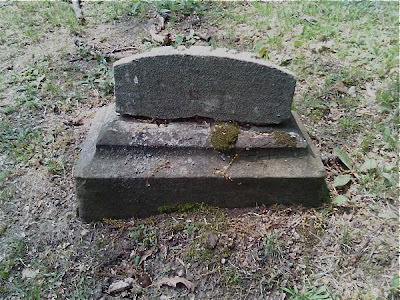 I searched the back of Allie's grave and noted the rough, uncarved bottom of the stone upon its plinth. This was never carved. It was broken. Allie's stone was incomplete. It had originally resembled Marion's stone but had suffered a break sometime between 1875 and 2009. This little cap was all that was left. 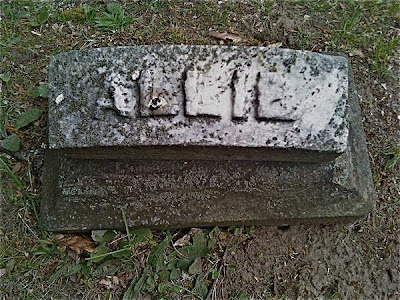 Someone had placed the little cap, still bearing Allie's name, back on its plinth. 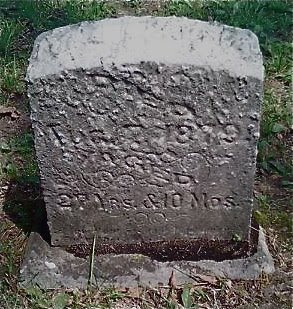 The rest of the stone, with Allie's death date and age at death, carefully carved by some stonecarver of over a century ago, was lost. As Dusty D absorbed this astounding discovery and stood back for a moment, the rest of the family plot came into focus. 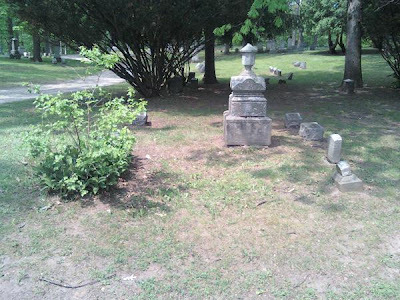 Seven McCulloughs are buried here, including Allie's mother and father, her sister Marion, and Benjimin, Mary, and Elmer, who were all born within a time span that could mean they were Allie's siblings as well, but which DD has not yet confirmed. If Benjiman, Mary and Elmer are Allie's siblings, then that means that Allie's mother witnessed three of her five children die before her own death--all three cut down at age 27 or younger. Mary, 1851-1919, and Benjiman, 1867-1894. 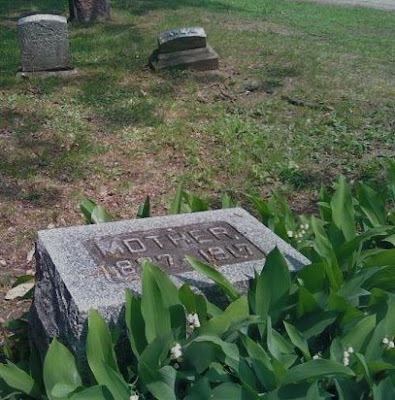 A view of Allie's and Marion's graves with their mother in the foreground. After I left, one thing haunted me. It was the tiny clump of moss hidden on the back of Allie's grave. One is the force of time and life moving on, in the 134th spring after Allie's death. 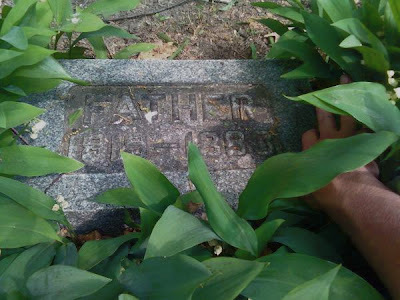 The moss's tiny roots are slowly eroding Allie's tombstone, and by extension, all community memory of her, despite her faithful diary entries. The moss also seems like a miniscule promise of persistent life. On inhospitable stone, whose carefully hand-carved information was long ago shattered and lost, a small, lush greenness, hidden in back, grows and thrives. 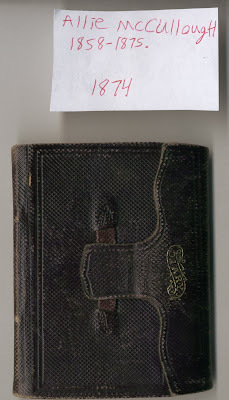 It is as tiny, and elegant, and full of life, and poignant, as, hidden in the Archives, Allie's small black diary. Mystery Photo: Can You Identify This Old Beauty? You've Got Mail: from Allie M.
Vote NO on Anti-Butter Proposal 4! Quiz Time: Date That Photo!